The Park Hotel Kapyla Helsinki is nestled away in the middle of the idyllic Kapyla area in Helsinki and is surrounded by rustic wooden homes and gardens. This peaceful location places it just outside of the rush and commotion of the city, but still keeps it only 6 kilometers from the city center. Excellent local transport connections near the Park Hotel Kapyla Helsinki allow guests to travel to and from the city center with ease. 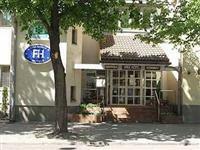 A number of comfortable and well-furnished rooms are available in the Park Hotel Kapyla Helsinki. With its relaxing atmosphere, delicious food, and friendly service, the Park Hotel Kapyla Helsinki’s on-site restaurant is popular among the neighboring artists and companies. During warmer weather, guests can enjoy their meals and drinks out on the court terrace. Spacious and comfortable meeting rooms are available in the property should any business travelers wish to hold a meeting while staying in this hotel. Guests looking for a way to relax can enjoy a refreshing dip in the pool or head to the sauna.